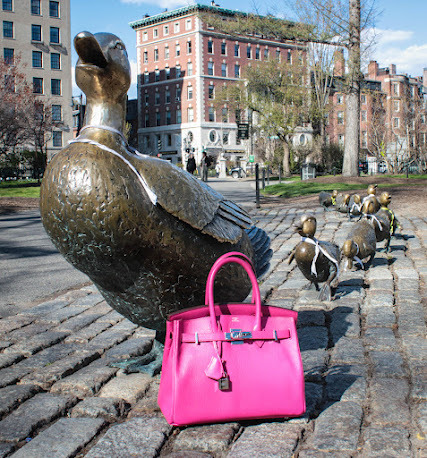 The weather in Boston had been beautiful so I decided, it was time to break out my pink purse. Of course, she had to have her picture taken. She is beautiful, isn't she?? 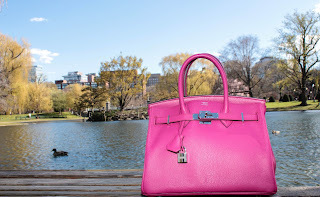 This was my dream bag and I was beyond thrilled when she arrived from Paris. Never in my wildest dreams, did I think I would one day own her. I can't tell you how excited I was when I got her. She only goes out of the house on nice days and always with her rain coat (yes, she has a rain coat) inside. 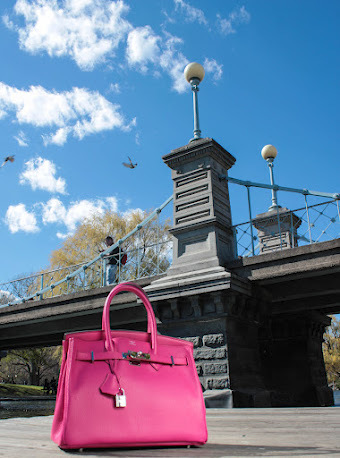 JenniSixx is not a fan of this bag as she thinks it's crazy that a bag has a rain coat and can only go out in the nice weather. I don't want to ruin her so I'm really careful with her. Yes, I'm crazy. 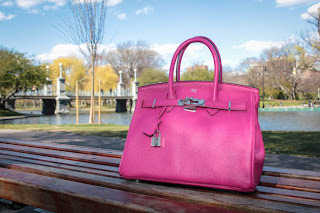 Do you have a dream bag? Which bag is it? Let me know, I love hearing from you! My dream bag is that Alexander McQueen black back with the skull and chains on it. I'd kill for it! Well not literally kill for it, but pretty close! HAHA. Which bag is that? Have I seen it? Black bag not back. Typo! Thank you!! The color is called Rose Shocking. Ooohh a Kelly Croc, Gorgeous!!! What color?? love that pink purse!! and love the back drops you picked for the shoot. it makes the bag pop even more! Thanks so much!!! Thanks for visiting my blog. Best, M.